October 6, 1973: With a roar of Arab Artillery, The very existence of Israel was threatened... and it continues to be threatened to this day. Conflict: Middle East is a masterfully detailed simulation of war in the Middle East - past and present! 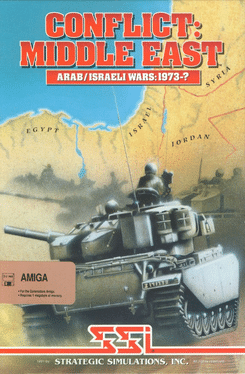 Conflict: Middle East offers you historical and hypothetical action - in the historical scenario, fight the entire 1973 Arab/Israeli conflict on an operational level! Command the Israeli forces and crush the Arab invasion by capturing both Damascus and Cairo. Or, take on the more daunting role of the Arab command: defeat the Israeli defenses and take control of Tel Aviv. The hypothetical 1990's scenario thrusts you into the modern-day Middle East, and stands ready to test the limits of your skill and imagination in a modern desert war! Extensive research by our game designers has produced simulations as advanced as the weapon systems used in modern combat. Set at the brigade/division level, you control every detail of land and air war down to the individual infantry squads, vehicles and gun tubes. You must also keep track of weather, supplies and politics as they will impact many of your options. Conflict: Middle East challenges the avid wargamer with two scenarios, six difficulty levels and multiple options. Make your mark in the desert sands - take command of the powderkeg that is the Middle East!